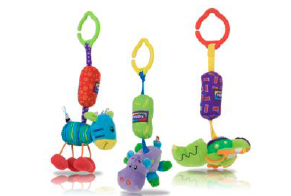 Are you looking for a fun, colorful toy to keep your baby entertained? We love these Safari Chimes by Nuby that we received for review! We love that they come in different animal shapes, which kids never tire of. They also have a great clipping mechanism, which means you can attach it easily to a high chair, stroller, or even on the diaper bag! We love storing them in the diaper bag because the is small enough for on the go fun! MamaBreak received item(s) in this post to review here on MamaBreak. We did not receive any other type of compensation. As always, our experiences and opinions are our own.